It’s that time of year when we get to spoil those who are dear to us, and we would like to spoil you, our customers. 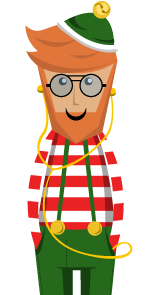 Simply follow our rhyme (on the competition page) to find Edison, our hipster Elf, within our ‘Help’ pages. Give us your details and tell us where you found him, and you could win a R2,000 Takealot* voucher. 2016 Has been a big big year for the SOLID Team, and we couldn’t have done it without your continued support, so Thank You. We are closing our Cape Town and Johannesburg offices on Friday December 23rd and will be returning to kick-start 2017 on January 3rd. During this period, as always, support will be available through support@soliditech.com. Have a wonderful festive season and we look forward to seeing you in 2017. *Takealot or similar depending on your country of residence.